Wake up to the gorgeous open feeling of the 12 foot windows that have an incredible view of Lake McGregor. Sit under the Shaded Gazebo or use one of our lounge chairs to bask in the sun. Often times you can see otters, turtles, and fish in the Lake. Ospreys, Egrets, Anhingas and the occasional Eagle like to use this lake as a fishing spot. Nature is very prevalent around the lake, and is a wonderful spot to enjoy a cup of coffee or a bottle of wine. This 2 Bedroom 2 Bath Townhouse on Lake Mcgregor is completely remodeled with new cabinets, granite counter tops, stainless appliances, travertine floors. Tastefully decorated with plenty of comfy sofas and chairs to make your stay relaxing. 2 queen size beds, one upstairs and one downstairs gives privacy for multiple couples, or separation from the kids. Internet, cable TV, laundry, Barbecue Grille, Surround Sound Stereo are some of the other features this townhouse has to offer. This Townhouse is pet friendly under 15 pounds. Hi; My name is John Grey and I have been using VRBO for my property for several years. Before we closed we almost said forget we will stay here forever! Sell all your stuff because this place is fully stocked with cookware, and anything you might need. It’s a quick to jaunt to Sanibel or Fort Myers Beach. Great place with great hosts. I think we made our first SWFL friends with John and Sherrie. Love it and thank you! My husband and I came to Fort Myers to get away from it all and clear our heads after the death of my dad. We needed privacy and quiet so we could just retreat and rest. This condo was PERFECT. We LOVED the floor plan and decor. The entire place was equipped with EVERYTHING a person could need. We have rented many places through VRBO and this place had the BEST appointed kitchen ever. We loved sitting outside and eating our meals, watching the wildlife on the water. John the owner was there to greet us and show us around a bit. Thank you for a great stay. We're golfers so we didn't spend a ton of time at the condo, however, it was nicely appointed and had everything we needed. The patio was great in the evening for relaxing as well as having a fish full of bass. Will definitely stay here again if we're in the Ft. Myers area. Really enjoyed our stay here. Had everything we needed, even washer and dryer. Backs to a small lake. Central to every where we wanted to go. This place was wonderful. It fit our needs perfectly. It was immaculately clean and ready when we arrived. Mr Gray, the owner, was more than accommodating and a pleasure to work with. The kitchen was very nice, the bed rooms, especially upstairs, was very only negative was the fact that they were redoing the stucco on the exterior of all the building and they happened to be doing our' the week we were there. But it really wasn't a huge deal as we were gone most of the days. The construction materials and equipment did keep us from using the patio as much as we would have liked but, again, it was only a temporary inconvenience. The work should be completed by now. The location was great, at least for us, and it was very easy to navigate around Fort Myers, Naples, and the beaches without having trouble finding our way back. The neighborhood was extremely quite and peaceful. We would DEFINITELY try to reserve this unit again. We very much enjoyed our stay at the John Grey property. Mr. Grey was very helpful with a couple of questions that we had and made the entire process easy. 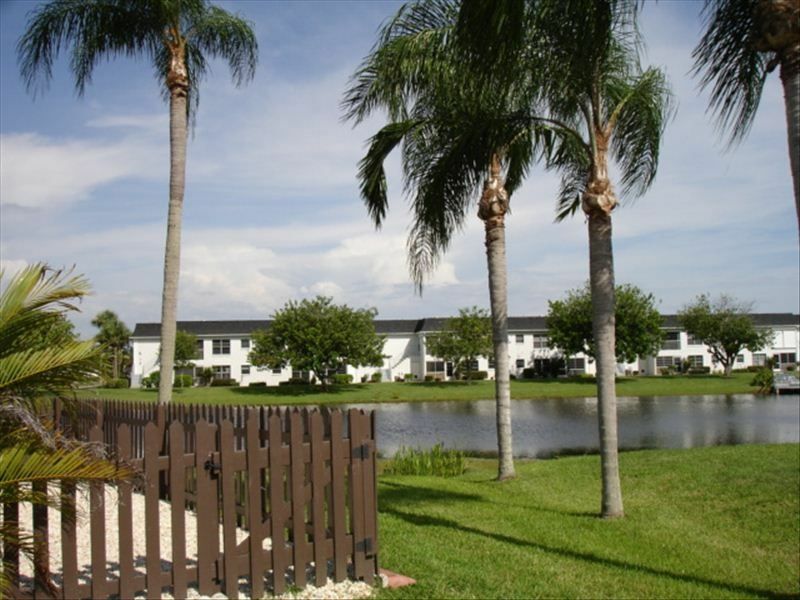 The townhome was perfect for our week get-away and we would certainly want to visit again when in Ft. Myers. thanks! The pin is a little wrong on the map. It is actually on the oval shaped lake to the east.